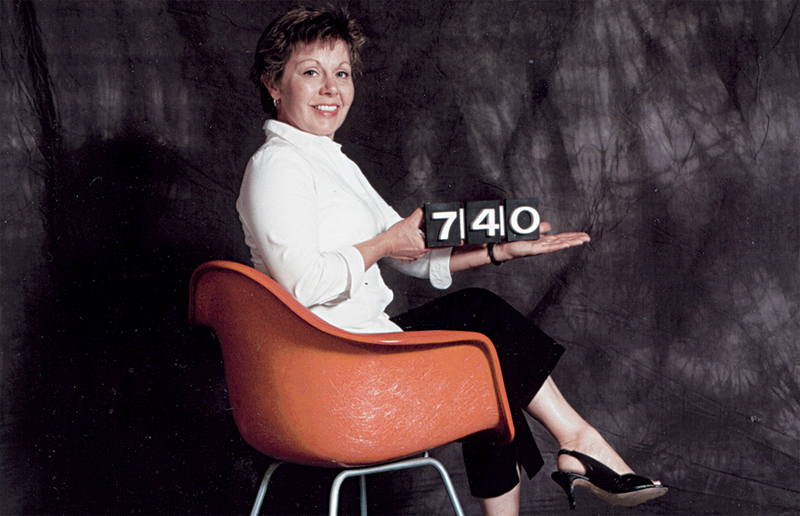 Carmen Nichols of Eichler Numbers. Photo: Eichler Numbers. Left: Eichler Numbers' eye-catching look. Right: Off-the-shelf variety not so sharp. There are several effective ways to spiff up an Eichler neighborhood's streetscape aesthetic, but perhaps none as eye-catching as adding that crowning touch—brand-new address house numbers. Carmen and Scot Nichols, proud 30-year residents of Eichler's Fairglen neighborhood in San Jose, agree wholeheartedly. After all, their Eichler Numbers, a cottage-industry business that they've been operating for the past 11 years, has one singular purpose: to make your home's address numbers look sharp and handsome, with the exact original look Joe Eichler had in mind. It all started on a walk the Nichols took in 2004 through their neighborhood, admiring the modernist style of their neighbors' houses. They noticed that one part of the homes in particular was not aging well—the address numbers—especially on homes on which they were mounted without overhang protection from the elements. Other homeowners had already lost their original address numbers, and turned to places like Home Depot for off-the-shelf replacements, which lacked modern good looks. Then Scot said, "'I think we could produce these,'" Carmen recalls of her husband's idea for a business for them to operate alongside his work as a general contractor and hers as a sales representative for a children's book vendor. "We thought, 'This could be kind of fun,'" she says today. "We kind of knew the neighbors, so we went in and took some rubbings [of the existing numbers]. Some had deteriorated pretty bad." Scot replicated the century-old Akzidenz Grotesk Medium Extended font used by Joe Eichler, made wooden numbers, and used them to create rubber molds. Then, using the same plaster material as the originals, they began manufacturing replacement addresses, which soon proved popular with Eichler owners. As the business slowly grew, however, the Nichols discovered that their plaster material did not weather well, especially when painted and exposed to the elements in places without an eave for protection.